Right at this moment, when I’m typing these words, the weather outside went from sunny to rainy in just a few minutes, but that rain had something magic in it, the way the drops were falling over my lush garden transpose me directly into a totally different mood about the recipe I’d like to share with you today. 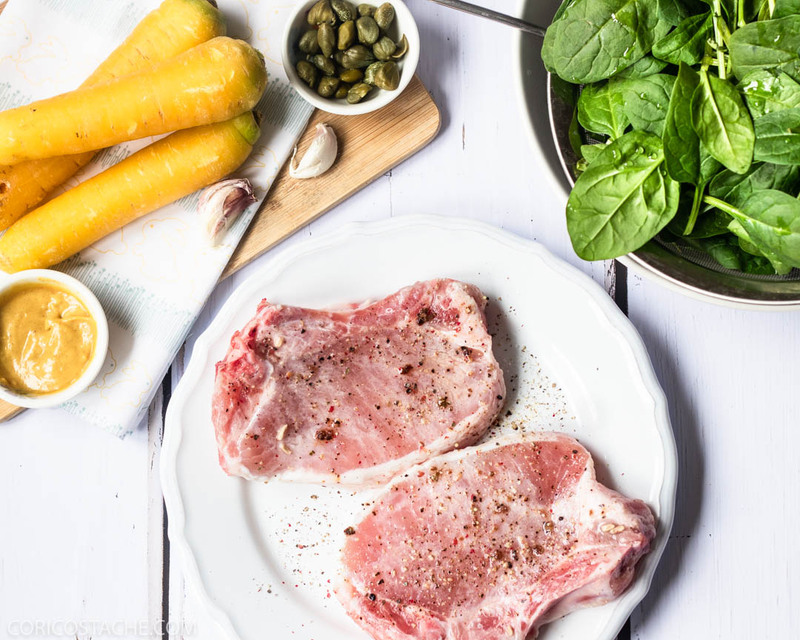 These pork chops with carrots, wilted spinach and mustard dressing are definitely made for family meals, to enjoy with people around, share good stories and sip a fresh glass of white wine. And yes, the weather outside made me fell like there’s a fireplace in the picture too, for the chilly and rainy spring evening. For the recipe you need a few basic main ingredients, which you most probably have in the fridge: pork chops, carrots, mustard, and spinach. And since all the recipes you read are just guidelines, you’ll be free to play around and just skip the capers in the dressing if you want, or add small pickled cornichons instead, it’s simply up to your taste and mood. But there are a few tricks which you would like to consider and follow for a better taste of the dish you are creating. One and the most important for this recipe is the meat pre salting process: the longer the meat stays with salt and other spices/herbs on it, the tender, juicier and tastier it will be after it’s cooked. I know there are two different opinions out there, both camps being categorically right and painfully wrong at the same time 🙂 But I prefer to stick to my own well known and proved method, which is pre salting the meat right after I buy it, sometimes hours before cooking it. This way I also give salt a chance to spread out all over the meat, not just on the surface. There are so many ways you can enjoy these pork chops, but I really like how the crispiness and sweetness of the carrots complements the softness of the baby spinach, and uhmm..that olive oil & garlic smell, could not miss from this one. 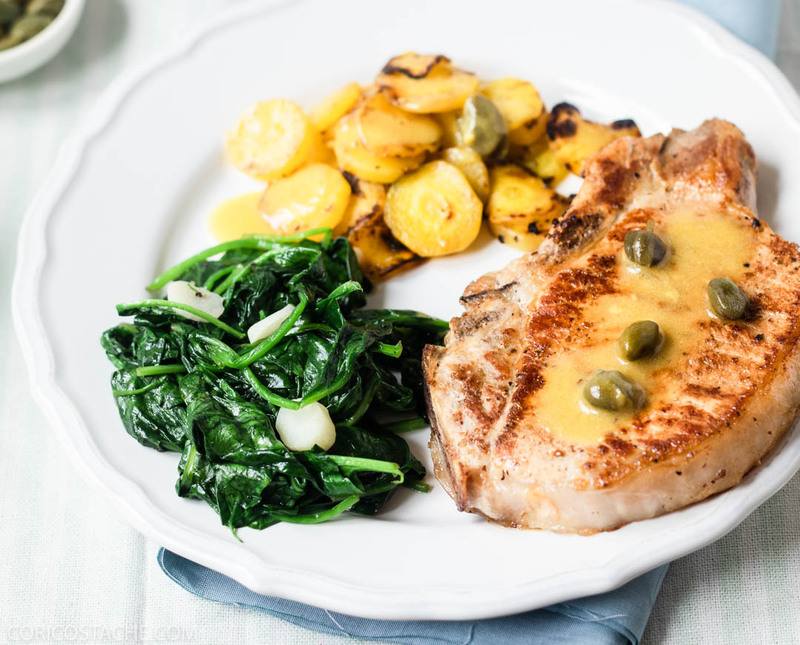 But then there’s the other duo which make the dressing, mustard and capers, and I love how everything is enhanced by the capers’ sourness and mustard’s creaminess, it gives the whole dish a strong personality. Would not do any harm if you just double the quantities and you pack this for your lunch box tomorrow, it’s definitely better than the food at the cafeteria. But before that, take your time and enjoy the evening or lunch spent with your family or friends, savouring the dish. Make sure that’s what I did! Pre salt the meat in advance. Add freshly grated pepper and 2 tsp of lemon juice and let rest in the fridge. Wash, peel, slice the carrots and set aside. Wash and dry the baby spinach. Let the meat adjust to room temperature before cooking it. Preheat a cast iron pan to medium heat and saute the carrots with 1 tbsp of olive oil, salt and pepper, until golden brown and slightly caramelized, but still al dente (about 10 min). 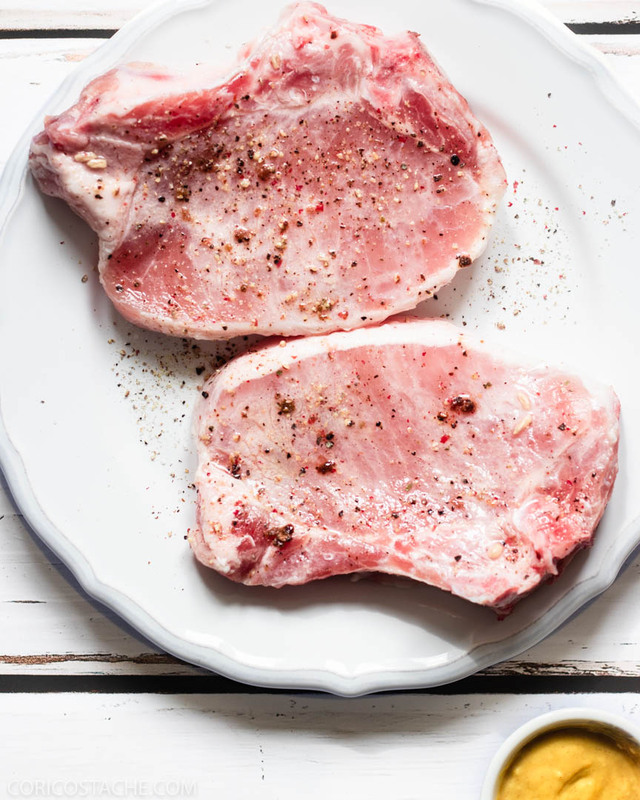 Preheat the grill or another pan and start cooking the pork chops, for about 4-5 min on each side, depending on the thickness. In the mean time, in the same pan you cooked the carrots, saute the baby spinach with another tablespoon of olive oil and the garlic cloves finely sliced. First add the garlic clove, cook them for 1-2 minutes and then the baby spinach. It doesn't need more than 5 mins to cook, as you only want it to wilt a bit, not cook completely through. Prepare the dressing my mixing the mustard, remaining olive oil, capers and honey. Serve the pork chops with the veggies on the side and the dressing over the meat.